There's no reason to recommend the Toshiba Q300 over any of the alternatives. These days you have quite a lot of options when it comes to solid state drives, and Samsung seems to be the clear leader when it comes to both price and performance, at least at the conventional 2.5-inch form factor. But Toshiba would like a piece of that pie, and the piece they’d like you to consider is the Q300 series. This unassuming alternative boasts low power usage and includes a free data migration tool, but is it worth considering over more popular models? Let’s find out. 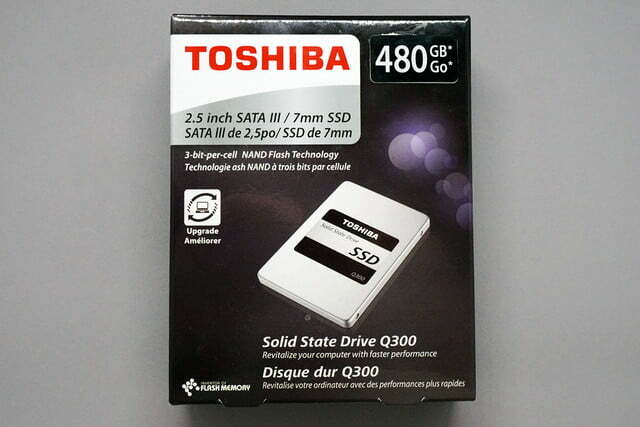 We were given the 480GB model of the Q300 SSD, which Toshiba lists with a retail price of $309.99 but can easily be found at around $200 from stores like Amazon and Newegg. The Toshiba Q300 is perfectly serviceable, but it isn’t competitive with alternatives from Samsung, Crucial, PNY, and others. That’s decent bang for your buck in terms of storage at about two and a half gigabytes to the dollar. The Q300 is the lower-end of Toshiba’s current offerings, which comes with a three-bit per cell design that’s cheaper and denser than the Q300 Pro series, but also has a shorter life expectancy. 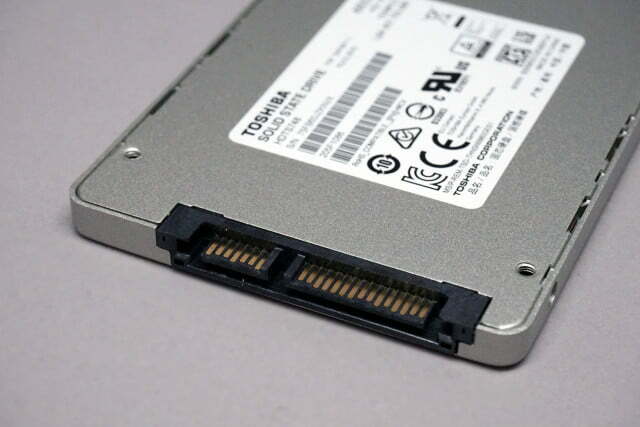 The drive uses a SATA III interface for power and data with a maximum transfer rate of 6 gigabits per second. Inside the box you’ll find… well, not much, actually. Aside from the packing materials, you get a user guide, warranty information, and a rectangular plastic spacer. The spacer is useful if you need to fit the drive into a standard 2.5-inch drive bay or enclosure – the Q300 has a height of 7mm, used in some of the more compact laptop designs, but you may need the spacer for desktop or portable installations to bring the combined height up to 9.5mm. Other than that, you get nothing; there’s no SATA cable included in the box, and the free Toshiba software needs to be downloaded from the web. 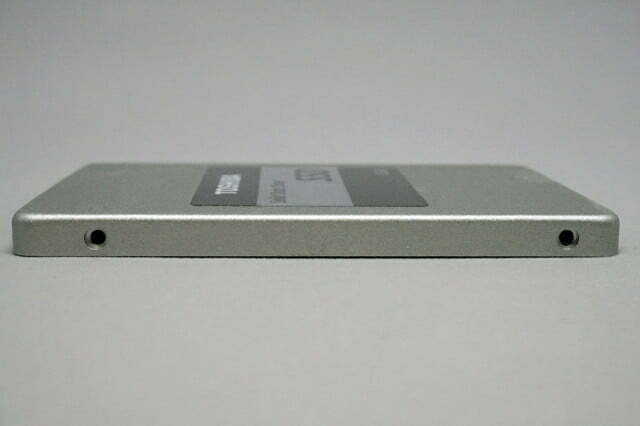 The Q300 is also available in capacities of 120GB, 240GB, and 960GB. If the Q300 was a car, it would be a Honda Civic: serviceable but not eye-catching. The metal casing is grey and the product label is black and white, pretty much exactly what you’d expect. It’s not exactly a necessary part of product design, since this drive is intended to be installed in a desktop or laptop and only gamers with see-through cases and excessive SSD lighting will actually see it on a daily basis, but other manufacturers at least manage a tiny bit of ornamentation. Mounting points are standard: two on either side of the drive and four on the bottom. So any flat mount should hold the Q300 well (and in fact it’s ideal for compact cases that like to slip 2.5-inch drive bays into the side of the case), and any sled-style caddy should perform well enough. There’s no method of affixing the spacer to the drive for those adapters that require a 9.5mm drive height, so if you need to use it you might want to add a bit of double-sided tape. 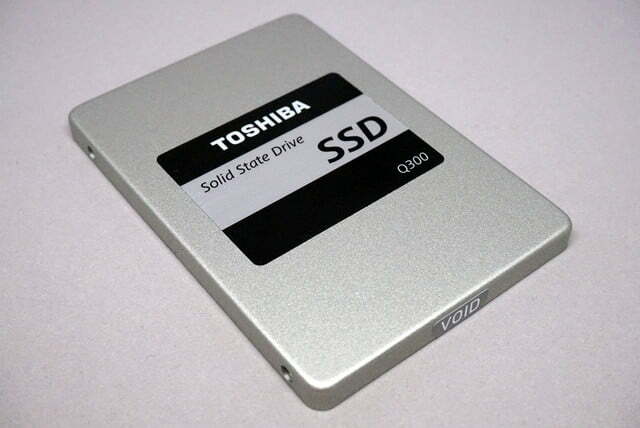 Just about any SSD upgrade will present a huge improvement in read and write speeds versus a conventional hard drive, and that’s clearly the market that Toshiba is targeting with the entry-level Q300 series. Inside the box you’ll find… well, not much, actually. 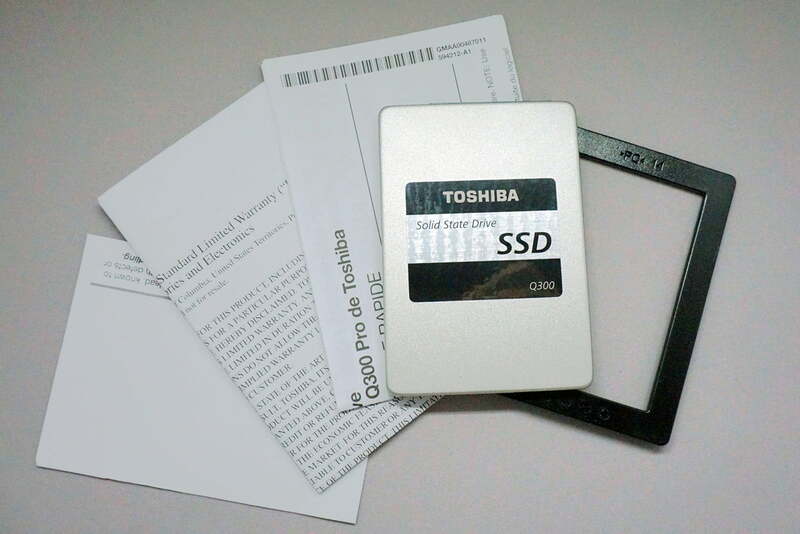 Even so, with widely-available competition, it’s as well to nail down the exact performance — Toshiba’s packaging and online product listings don’t mention specific speeds beyond the 6Gbps speed of the SATA III standard itself. That doesn’t inspire confidence in the more technical aspects of the drive. According to CrystalDiskMark’s sequential speed test, the Q300 can read data at 284.2 megabytes per second and write it at 247.3 megabytes per second. HDTune gets similar results: a maximum of 243.7MB per second, averaging slightly lower at 231.3MB. Toshiba’s limited warranty covers the Q300 for three years, at least for the version packaged for sale in the US and Latin America. That covers device malfunction, but as usual, any accidental damage (real or “determined” by Toshiba upon a return) will not be covered. Strangely the company directs any service inquiries to its website in the US, while a phone number is provided for those who purchased it elsewhere. Compared to other manufacturers, Toshiba keeps up. Samsung, Crucial, and SanDisk all offer three-year warranties on their comparable ~500GB drives. Since storage media of all kinds seems to be at least as susceptible to failure as other computer hardware (if not more), you might want to keep that warranty card in a safe place or scan it into your computer. The included quick start guide directs buyers to toshibastorage.com/q300-q300pro, where you can download a copy of NTI Echo version 3 (after entering your email and personal info). Oddly, there’s also a listing for “SSD Utilities” and an accompany user manual, but they won’t be available until December of this year. 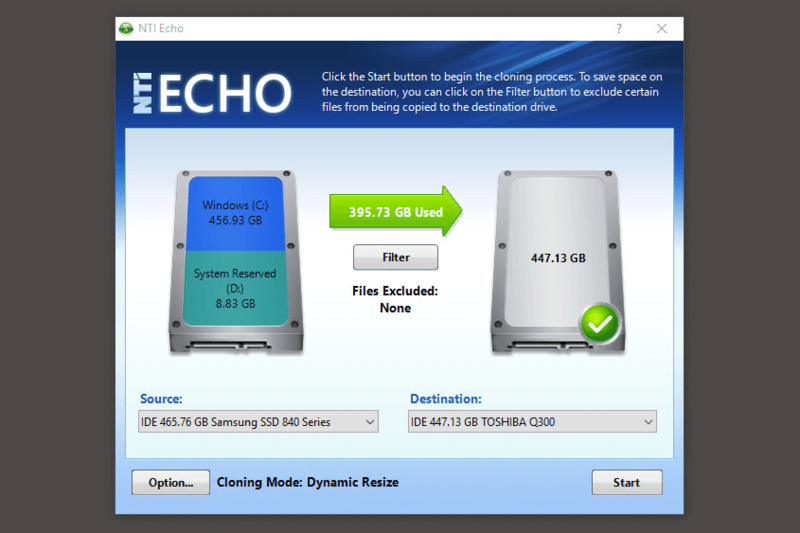 That said, the software is pretty basic, offering a partition or full-drive clone service and not much else. It’s handy if you happen to be moving from a regular hard drive or a smaller SSD to the new drive (and you’re free to use it to clone other drives as well). Even with a few extra options like dynamic, one-to-one, or manual partition resizing, this freebie isn’t something you’re going to employ on a regular basis. It also doesn’t do anything that free, entry-level disk clone or partition manager programs can’t handle. 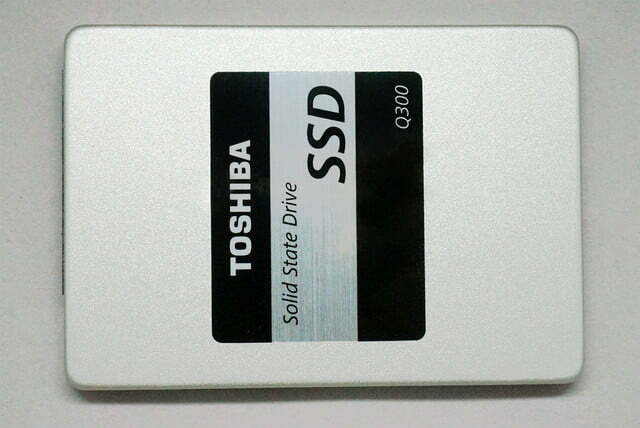 Toshiba’s Q300 fares pretty poorly when compared to other entry-level SSDs at the 500GB level. Take this with a grain of salt, since storage prices tend to fluctuate considerably from month to month, but drives from the bigger manufacturers are currently floating at around $150-180. It’s hard to find anything approaching the $200 street price of the Q300 without jumping up to faster speeds and more expensive components in the “pro” SSD market. These prices were current as of October, 2015. Get a great price with this Monoprice cable that comes in under four bucks. Slide that drive into this enclosure with a USB 3.0 port to make the most of that SSD speed. 480GB will be enough for most users, but if you have a ton of photos, videos, or game files, you’ll need a little more breathing room. The Toshiba Q300 is perfectly serviceable, but it isn’t competitive with alternatives from Samsung, Crucial, PNY, and others. In terms of price, fit and finish, and even such incidentals as packaging, there’s simply no reason to choose the Toshiba drive over its competitors. 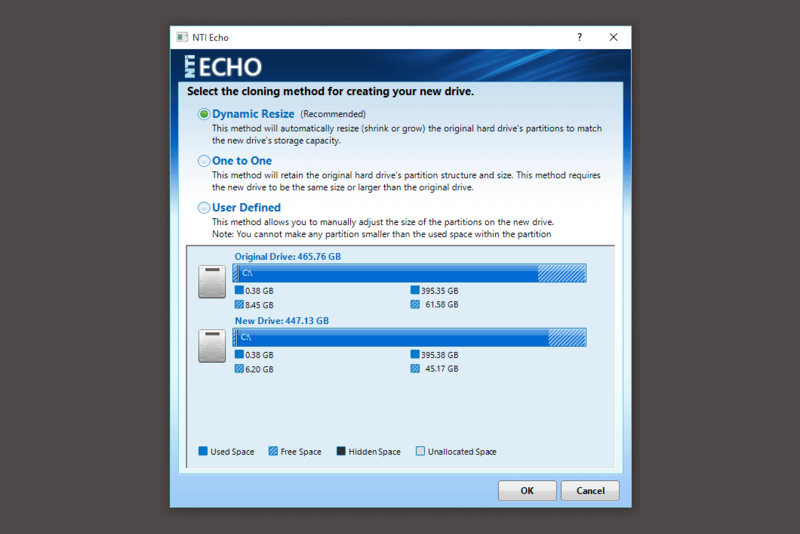 The included NTI Echo software is a respectable utility, and it will save you a search for a free alternative if you’re migrating a Windows or storage partition to a new home. But it won’t make the difference in price or warranty, either, and other manufacturers also offer migration software. It’s possible that the Q300 and its sister SSDs will drop in price after they become available for a few more months, especially as the market continues to choose cheaper models. 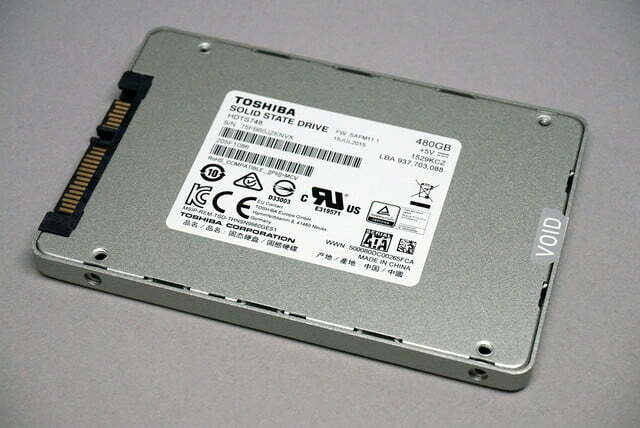 But without a significant discount to bring it to parity with similar drives in the same capacity range, there’s no reason to recommend the Toshiba drive over others.